Despite boasting of quality players like Virat Kohli and AB de Villiers, Royal Challengers Bangalore (RCB) has struggled to win the coveted Indian Premier League (IPL) title. RCB has been runner-up three times (2009, 2011 and 2016) and apparently failed to win the finals. Interestingly, the Bengaluru-based franchise has not made it to the playoffs in the last two seasons. RCB Squad in IPL 2019: Team Profile, Schedule of Royal Challengers Bangalore in VIVO Indian Premier League 12. The team has over the years maintained a fine blend of young and experienced players in their squad. With Kohli and De Villiers’ presence around, it has helped young players learn a lot. Yuzvendra Chahal is one example, who has done well under Kohli’s leadership and the spinner is a regular member of Indian limited-overs teams. 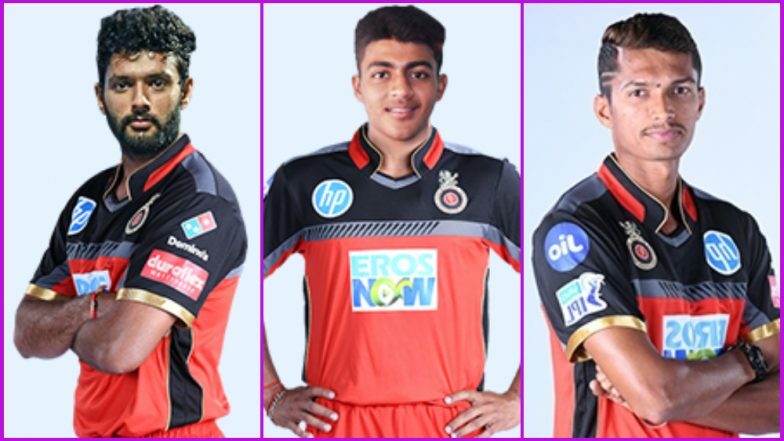 We have listed three young players from RCB squad that we think could be useful for Kohli-led side. Shivam Dube: The medium pace all-rounder is known more for his batting abilities, especially the big hitting. While playing for Mumbai in the Ranji Trophy, he smashed five sixes in an over. This is something he has done quite often throughout his career in Mumbai. He is highly regarded a clean hitter of the ball and former India captain has tagged him "India's cleanest hitting left-hander since Yuvraj Singh.” Though in 15 T20 matches, he has scored only 202 runs, his strike rate of 147.44 is worth noticing. Royal Challengers Bangalore Tickets for IPL 2019 Online: Price, Match Dates and Home Game Details of RCB in Indian Premier League 12. Navdeep Saini: The 23-year-old is one of the upcoming talents as far as fast bowling is concerned. Navdeep is known to bowl over 140 kmph consistently. The Haryana pacer was also named in India’s Test squad against Afghanistan though he failed to make it to the playing XI. He was with RCB squad last year as well but never got a chance to make his debut. In 21 T20s, he has picked 19 wickets with an impressive economy of 6.35. Prayas Ray Barman: The leg-break bowler is just 16 and has already earned himself an IPL contract. The tall spinner from Bengal was snapped for INR 1.5 Crores. Barman is expected to play a key role along with Yuzvendra Chahal though he will have to go past Washington Sundar and Pawan Negi, who are part of RCB as well. Royal Challengers Bangalore will be desperate to lift their maiden IPL title. The first target for the Bengaluru-based franchise will be to qualify for the playoffs. Last season, RCBC managed to win just six games out of 14.